Europe District Cooling Pipeline Network Market size in 2017 was valued over USD 900 million and the cumulative installation is set to exceed 1,500 km by 2024. Europe district cooling pipeline network market is set to grow on account of ongoing adoption of sustainable cooling systems along with growing regulatory measures pertaining to GHG emissions. Rising space cooling demand coupled with increasing penetration of sustainable technologies across the region will foster the industry growth. The National Emission Ceilings Directive (2016/2284/EU) introduced in December 2016, has laid down ambitious targets for reducing emissions of six pollutants by 2020. Longer life cycles, higher efficiencies, low maintenance & operational cost and reduced cooling losses are some of the vital parameters which will drive the Europe district cooling pipeline network market. Changing climatic conditions across the Eastern and Central regions owing to increasing temperatures will in turn propel the industry growth. Furthermore, according to EEA, there will be a temperature rise between 1 to 30 C across regions in the coming years. The pre-insulated steel pipe will witness a significant growth on account its ability to withstand varied temperature range. These are rigid and flexibly bonded steel pipes with a polyurethane foam and an outer casing of polyethylene material. These are available in wide range between 20 mm to 1,200 mm pipes. Polymer pipe is anticipated to grow owing to rising demand as an efficient substitute to its competitive counterparts. Low emissions, ease of transport, corrosion free and up surging use as a service pipe are some of key product features which will boost the Europe district cooling pipeline network market share. These are insulated with flexible polyurethane foam with a PEL casing to provide them more flexibility. 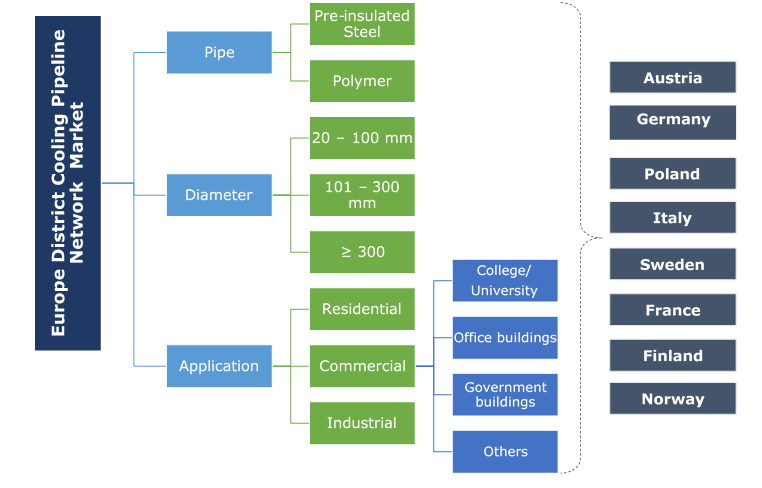 Increasing adoption of small scale DC systems coupled with government backed R&D initiatives toward the development of efficient insulating material will drive the 20 – 100 mm diameter pipes. 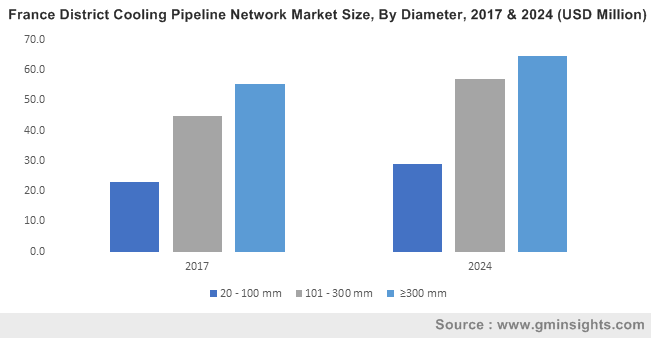 Increasing use across the region, primarily as service pipe on account of their ability to get easily rolled, transported and installed across the establishments will stimulate the Europe district cooling pipeline network market. The 101 – 300 mm diameter pipes in 2017, accounted for over 35% of the Europe district cooling pipeline network market share. Increasing use as a primary thermal transfer medium across the space cooling network will stimulate the product penetration. Accelerating investments toward the development of commercial and residential establishments will further flourish the product growth. Residential district cooling pipeline network market is anticipated to grow on account of increasing investments toward the deployment of government backed sustainable establishments. Growing adoption of small scale DC systems across tier 2 and 3 cities has further led to the adoption of cooling networks. The commercial district cooling pipeline network market is set to grow over 2.5% by 2024. Growing investments toward the development of sustainable and efficient building solutions along with increasing cooling space across the service industry will foster the industry growth. Introduction of stringent building emission codes favored by amicable regulatory policies will further strengthen the business outlook. Ongoing government measures toward the decarbonization of buildings favored by the deployment of renewable energy technologies will drive the Germany district cooling pipeline network market share. Increasing public and private investments toward smart buildings solutions coupled with numerous government initiatives including SFSB, EPBD and ELENA facility will stimulate the industry growth. In 2017, EEEF and Celsius have formed a joint venture to develop district heating and cooling networks across Europe. Sweden district cooling pipeline network market is set to reach over 500 km by 2024. Ongoing adoption of sustainable energy sources favored by stringent regulatory framework toward conventional fuel will stimulate the industry growth. Increasing temperature range owing to the countries proximity near the gulf stream will also propel the business growth. France district cooling pipeline network market is set to grow owing to strict government norms toward adoption of energy efficient technologies coupled with growing population across the country. In addition, the ongoing adoption of innovative systems along with energy efficiency solutions will further propel the industry growth. Key industry players across the Europe district cooling pipeline network market include Uponor, Brugg, Logstor, ThermaFlex, CPV, Isoplus, Aquatherm, KE-Kelite, REHAU, Huntsman, Cosmoplast, Permapipe, Eval Europe NV and Future Pipe Industries. Increasing investments toward R&D along with numerous private initiatives to intensify their presence has been a significant strategy adopted by leading industry players across the Europe district cooling pipeline network market. In addition, the paradigm shift toward the customization and development of DC grids and expansion of existing facilities to cater the growing consumer base has been a point of focus for business growth. District cooling pipeline networks are used for the transference of thermal energy/cool energy from the cooling plants to the consumers. Purified water is a major source for transporting energy as it easily absorbs energy and has a high specific cooling capacity. The pipes used are generally steel and polymer pipes with an insulating material of polyurethane and polyethylene.